Last week I spent some time doing library research, an increasingly rare activity for me in the age of digitized sources. Looking at early 1980s issues of a major restaurant trade journal I was struck by how unappetizing the food looked. The problem may have been partly due to poor photography but it was also due to the way food was presented, including how it was discussed. My reaction was so strong that I began to wonder briefly why I had ever been attracted to eating in restaurants. It wasn’t the first time I experienced distancing from how restaurant trade magazines approach food. It has often seemed to me that there is a deep gulf separating how home cooks think about food as compared to how the restaurant industry – as reflected in trade journalism – does. Here’s an example. 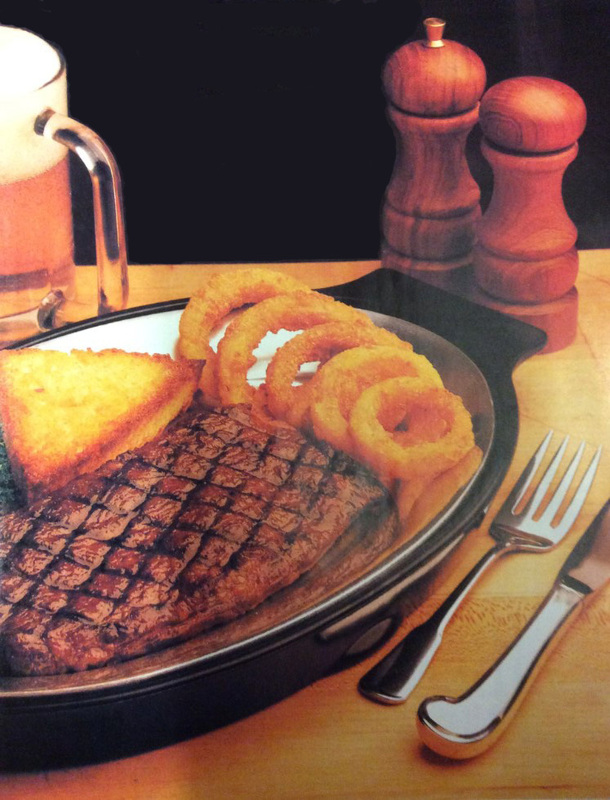 What do you see in the image above of an excessively grill-marked steak accompanied by geometrically arranged onion rings and a yellowy triangle of Texas toast? The photo was part of an advertisement for portion-controlled steaks, accompanied by the text below. I have italicized the words that I find bizarre and alienating. Heh, it’s interesting to see the behind-the-scenes thought processes in any industry. This is certainly different from how the end product would be marketed to the consumer. Even small Mom ‘n’ Pops need a steak on the menu for that guy who just doesn’t want a burger. And this way QC isn’t an issue. Sysco delivers. One very good reason that you were attracted to eating in restaurants is the cooking odors they send out in the air to grab you as you go by.